Oh my. You're gonna love this. And it's an amazingly quick and easy dessert too. Especially when those heavenly dark cherries appear in the market or, if you're lucky enough to be in Michigan, at one of those delightful roadside stands. My daughter and I would drive along Michigan's M31 on the way to Petoskey, stop and buy cherries and spit the seeds out the window. (Now we'd probably be arrested for littering.) Anyway, I wasn't sure I'd have enough left to make this I was so busy snacking on them. Deb at Smitten Kitchen came up with this recipe in July of 2007. She used the Ceres & Bacchus’s Plum Clafoutis recipe which, oddly enough, had question marks for some of the ingredient amounts. I had to scroll down and read all the comments before I found the numbers. Basically, it's a Yorkshire Pudding recipe. With fruit. Sort of. It puffs up and ends up looking like a cross between a custard and a cake. Smitten Kitchen says: "Larousse Gastronomique and other traditionalists insist that the pits impart an almond flavor when baked within the custard, something no authentic clafoutis should be deprived of." So I did. I left the pits in (oh so much easier on the chef) and just warned everyone so there weren't any unexpected trips to the dentist. Calfoutis are considered one of the glories of the French peasant table. It's best served warm and eaten the day it's made, but Deb also suggested trying it for breakfast the next morning with yogurt, something I couldn't do 'cause there wasn't a speck left. If you're thinking it would be too sweet, you're wrong. It's really not an overly sweet dessert at all. I'll try not to post too many cherry recipes ( I also found some Rainier cherries in the same market) in the next few weeks, but will space them out here and there. Rather like my rhubarb recipes. I do apologize for getting on these obsessive fruit kicks. But I did make something really healthy last post, right? Preheat oven to 400°. Butter a glass pie pan, round baking dish, large cake pan or oven proof skillet. Scatter the cherries (with or without pits) evenly over the bottom. Beat the eggs and sugar with a whisk until lighter in color. Gradually add the melted butter, beating to incorporate. Add the flour all at once and whisk until the batter is well mixed. Slowly add the milk a little at a time. Then the vanilla and the rum, if using. The batter should be smooth and very shiny. Pour the batter slowly over the cherries and bake for 30 to 40 minutes until slightly browned and almost set in the middle. Allow to cool at least 15 minutes before serving. Barbara, you are so right. I can't wait for those Michigan cherries to show up. I like to make clafoutis for dessert and finish them off at breakfast. This recipe sounds delicious! What a wonderful recipe. It is coming with me to Montana this summer where we are fortunate enough to get fresh Flathead cherries from the NW corner of the state. This will be perfect for them. Thanks. First of all you had me at "quick and easy" but the final product...wow, fantastic! That is so funny about eating Michigan cherries like that. 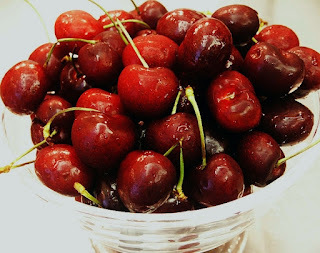 When driving home from church camp at Upper Silver Lake in Mears Michigan (when I was a kid)we always stopped at a roadside stand to get cherries, and we would eat them on the drive home, spitting the pits out the window (they're biodegradable). Now I live in Florida too. I still try to get Michigan cherries or apples when ever I can find them! How I miss having clafoutis. It's been a while. Yours looks fantastic!! Delicious! I've never made a clafoutis but keep meaning to do it every summer- maybe this year...I've also heard that it should be cooked with unstoned cherries in, but I think I'd cheat and use stoned ones- harder on the cook but easier on the eater!! Hey Barbara, I love clafoutis! And the cherries you used look beautiful-it's almost time for us to start seeing them here! I want a slice of this right now, and my Cauldron Boy just leaned across me to see it (smile). Man oh man, that clafoutis looks fantastic. I really love cherries! What a great food to celebrate the Memorial Day! Since I'm not staying in US, I'm not sure the difference of these cherries but one thing I know is they're sure taste fabulous after cooking. Have a nice day! I have a simple recipe that I use from Everyday Food, but it uses pears. I'm going to sub cherries as soon as they come in season here! I bought some cherries today and I have to say, they were totally lackluster. The real season must not have hit here yet! This clafouti looks gorgeous. I love that custardy texture. That's really funny because I made clafoutis last week, although from a different recipe with ricotta which I'll post soon. Yours looks gorgeous and I'd like to try but just one thing; regardless of Larousse's opinion, I just can't leave all those stones in, even if it means splattering and extra work for me so I pitted 500g of cherries last week which wadn't my favourite job. It looks so rich - you were right! I love it already - and when I heard you don't need to remove the pits - even better! flognarde. ha. thanks for that tidbit of info--i had no idea! and wow, the notion of not needing to pit the cherries is very appealing--i'd be all over this particular treat. bring on the cherry goodies, barbara--i'm game! Cherrie's are $3.99 a pound, so we are getting there! I will start buying them when they hit $2.99. As for the clafouti, it looks great! That's one recipe I've been curious about, but never took the time to try. No cherries here yet but I'll be making this, for sure, when they arrive. My mom would love this! Cherries are her favorite! Clafoutis are so easy and a wonderful response for surprise dinner guests. I'm waiting for local cherries. 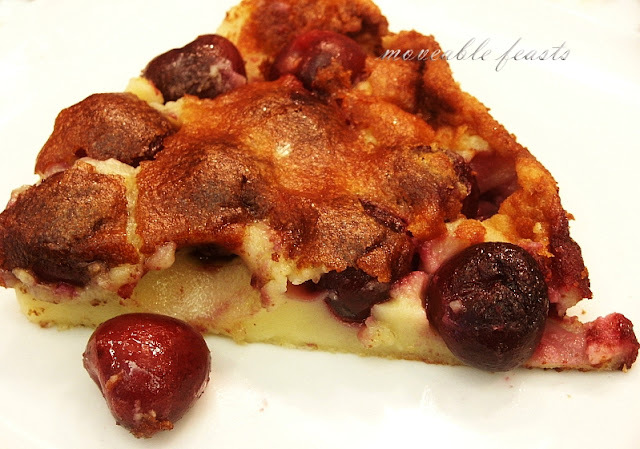 Clafoutis are one of our favorite deserts and I've seen cherries in the market also. I didn't know that with any other fruit they were called Flognardes. I'm making a note. Have a great Memorial day weekend Barbara. Sweet black cherries are still big in Michigan..the tart cherry isn't like it used to be, as they closed the pie plant in Traverse City..
Just gorgeous! Thanks for the info on leaving in the cherry pits - I've heard it's recommended, but never knew why. Have a lovely holiday weekend! Oh my! How delightful! Your suggestion on the cherry pit reminded me of a tart I ate in Provence which contained cherry pits too. I am looking forward to trying this recipe! I love clafoutis! but I didn't know it was called a flognard using other fruit, good to know! Yours looks absolutely fantastic. That looks scrumptious and denser than the yorkshire puds we're used to. I wonder if it would work with splenda? A diabetic I know would adore this. I appreciated your comment regarding my post, though we may disagree on some points, I'm glad you responded thoughtfully. mmmm, i LOVE cherries! this is beautiful, what a great way to use them. I have been eating some dark cherries for a couple of weeks now! What pleasure they are! I have never made clafouti because I was never sure about the pitting issue: to pit or not to pit;thanks for clarifying this! Your clafouti looks luscious! All I can say to this one is***YUMMO*** I cannot wait for cherrie season now. I hope you had a wonderful holiday weekend Barbara! I'm saving this mouthwatering dessert for when our Bing cherries appear at the farmers market. I love cherries and am so happy to have a recipe that will show them off. What a gorgeous clafoutis! I can't wait to make one - and enjoy the leftovers for breakfast. Happy Memorial Day! This is a great dessert to complete any meal of the day! Looks yummy and creamy.. I've never tasted clafoutis or Yorkshire pudding. Looks like I'd better buy some cherries. It looks delicious. My daughter brought some cherries home but I doubt there are any left. I do have blueberries though. Hmmmm. Not too sweet dessert? Ooh, sounds amazing to me, and looks awesome with those red spots in there. I've never had a clafoutis before. MUSt make this happen. I absolutely adore Michigan cherries. When I drove cross country a few years back, I must have hit Michigan during prime time cherry season; oh so good! Ok, I confess to spitting pits out the window too. I may just be able to pull this goodie off. We'll see. In the meanwhile, it looks oh so scrumptious and I have bookmarked it for when I'm feeling adventurous and cherries are at their prime here in PA.
You are right, I am loving this. Delicious. This will be so delish!! Barbara, A Moveable Feast is on of my favorites by Heminway!! This clafoutis is delicious looking! You continute to outdo yourself every time you post. What were the results of eating clafoutis with the pits? Lovely photos by the way. Cherries are one of my all-time favorite fruits so you won't bore me at all with more recipes ;) I've not tried making a clafouti myself but would love to try this recipe when the summer cherries arrive here! Oh Barbara, I would just eat the pan of cherry clafoutis by myself. I think I am lucky, because none of my family member like it, they love cherry, but when I make dessert with cherry, they just simply won't touch it. So, I am the lucky one. I had no idea that clafoutis must include cherries, If I did I never realized it until now!? That fact is fascinating me! I love cherries any possible way I can eat them and this recipe is fantastic! Hey, maybe there are some roadside cherry trees in Michigan that have you to thank for their beginnings! Cherries are one of my favourite fruits, I love them. However we have to wait until about December before we get them again here. This recipe looks great and thanks for sharing. Enjoy your cherries, I know you will. Oh my! Cherries are one of my favorite fruits. I usually don't like to cook with them because i just like them so much natural. We get amazing Rainer cherries here in Seattle that are just to die for. But this recipe looks so good that i just must have to try this out. Delicious! 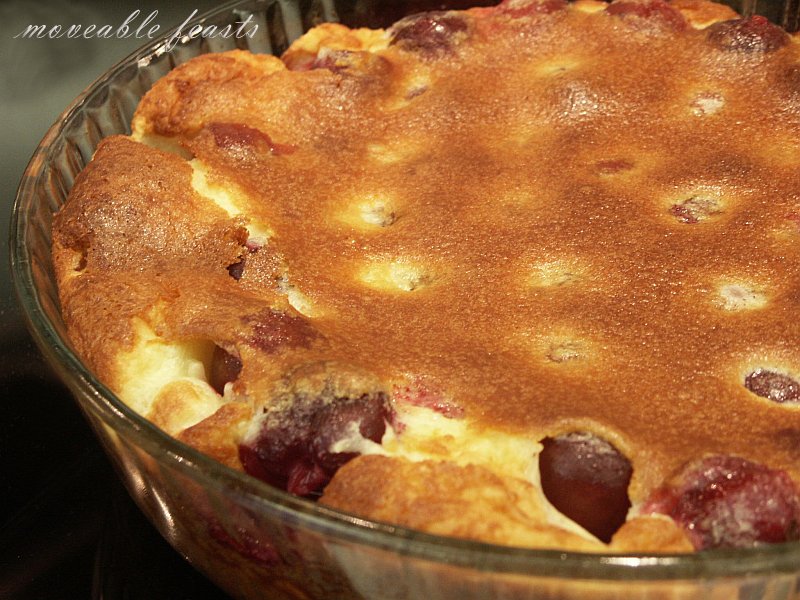 This looks a bit more like a flan than a clafoutis but how I love flan - and cherries! A must try this summer for sure! oh my - I haven't had cherries in so long and now I'm really craving them! I love cherry clafoutis, it looks fabulous! 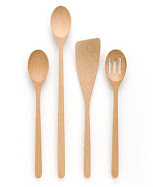 I need to make it soon, and I still have so many cherries so that will be perfect! I grew up eating so much clafoutis! I love love love it. In Britanny, they replace the cherries with prunes and it becomes a "far aux pruneaux" which pretty much everyone seems to eat over there. Your clafoutis looks great! Hi. I can't remember if I commented on this yet, although I have come back several times to drool and admire. I love clafoutis. And cherries are classic. I'm making this, thanks! Oooh, this makes me excited for when we get fresh cherries here! Oh, yes, clafouti!! So easy, SO good! I'd nearly forgotten... Thanks for the reminder! I also love the recipes of Deb from Smitten Kitchen! This cherry clafoutis looks marvellous!! It's my favorite cherry dessert (aside from eating them freshly plucked from the tree) and it took my moving to Europe to discover it. But it seems lots already know/knew about it! The version I use is so simple it just involves piling all the ingredients together before dinner (minus berries) and them popping in the oven a half-hour before the cheese course...ta-dah, that much more time on the terrace. I LOVE your photos, you make it look particularly luscious. I'm not one of those people crazy for anything cherry but I do like them and have always wanted to make a clafoutis. I don't have cherries at this time but I'm keeping my eyes open for them the next time I'm at the grocery store. Rhubarb Fool and a Father’s Day Giveaway!